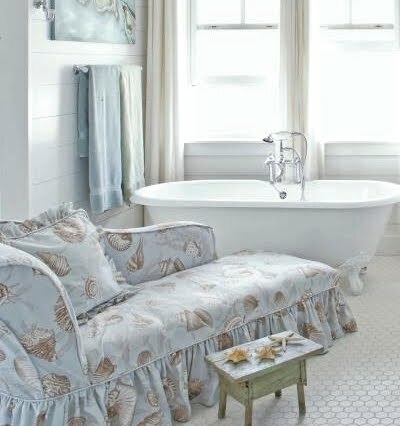 Examples of great upholstered chairs with Coastal Fabric, followed by a tutorial and fabric sources. 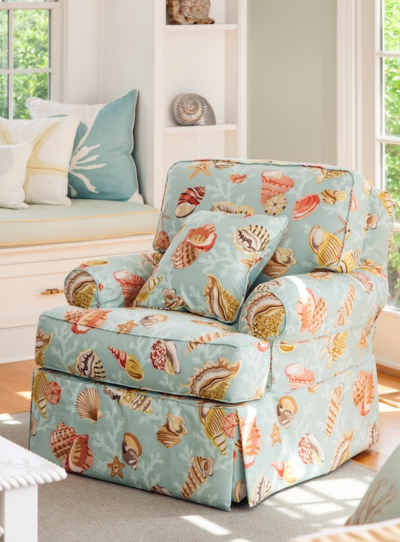 Sofa chair upholstered in seashell fabric in a New England home, featured here. 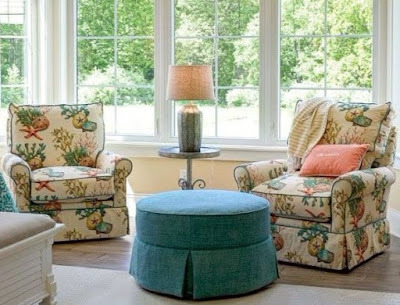 Chic upholstered chairs seen at Kathleen Hay Designs. 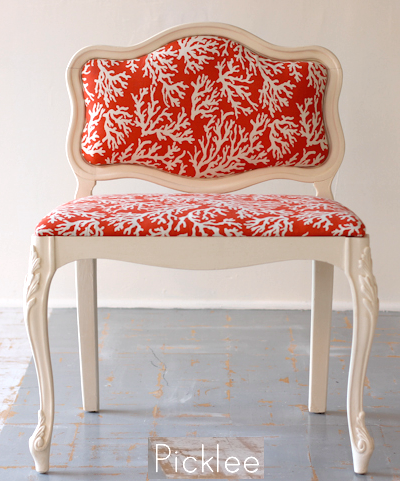 Chair upholstered with Lobster Fabric. 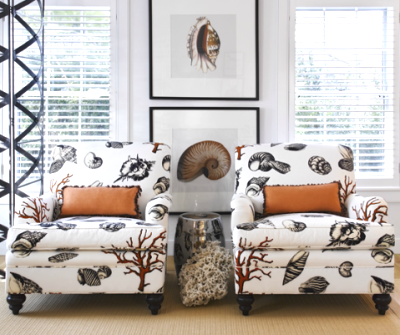 Traditional upholstered chairs with a sea life pattern via CVI Design. Original source no longer available. 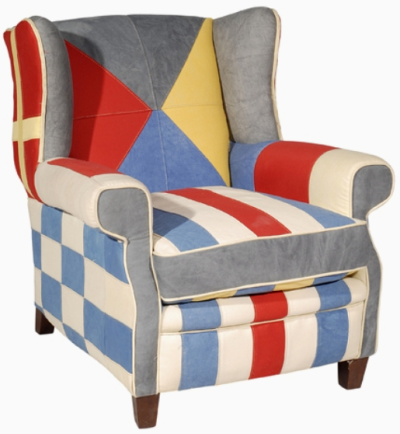 A spectacular wing chair makeover. Original source unknown. 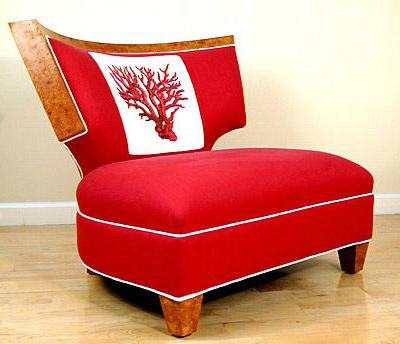 A Coral Chair. Bold and elegant. 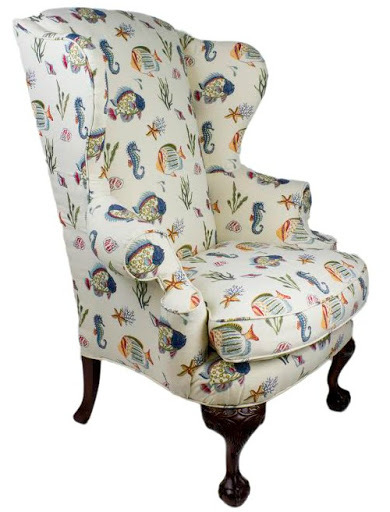 A coastal upholstered chair fit for a queen. Via FB of Completely Coastal Furniture in Jacksonville FL. 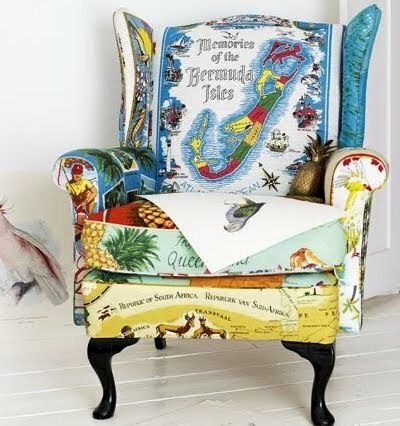 A whimsical map design on a classic wing chair. Seen at Lonny. Tropical palms, seen at Coastal Living. 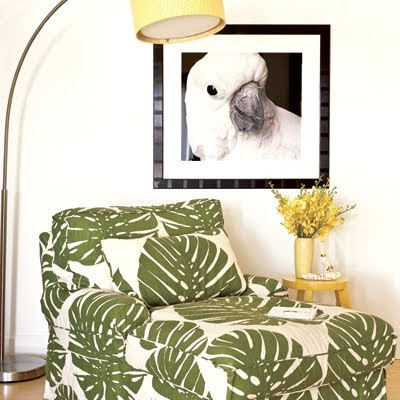 This upholstered coastal chair features an image. Source unknown. 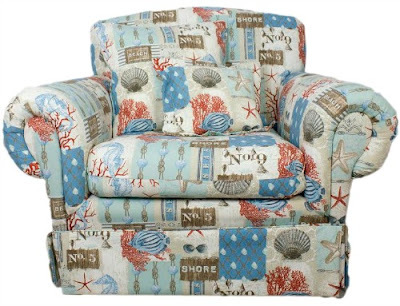 Swivel chairs upholstered in a playful sea life theme fabric. Source unknown. Something more minimal. Source unknown. 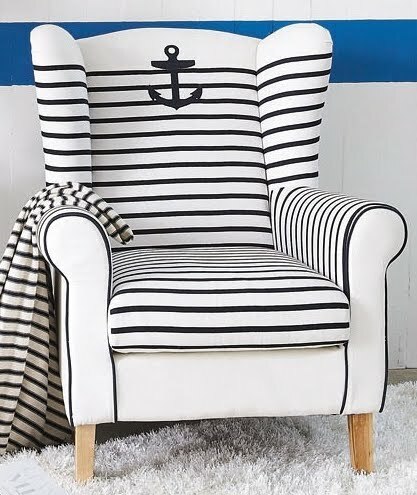 Chic nautical upholstered chair with stripes. Seen a Maison du Monde. 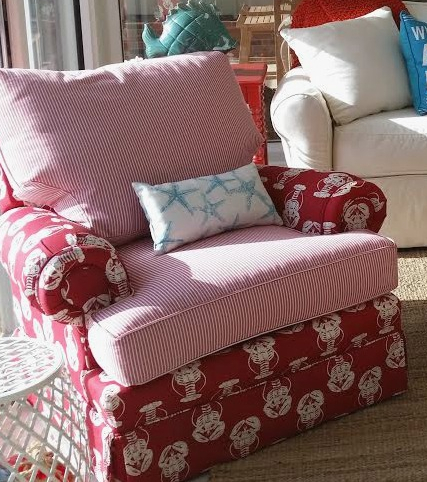 Nautical flag chair from The Well Appointed House. 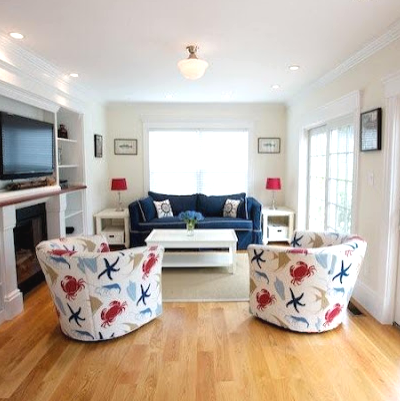 Another take on nautical in a Cottage by the Sea. 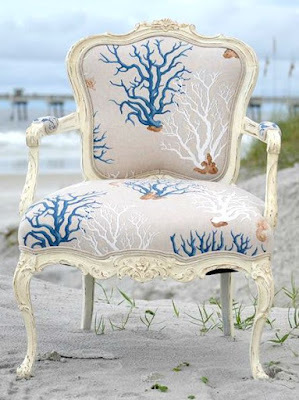 A coastal upholstered chair gone wild with seahorses. Source no longer available. 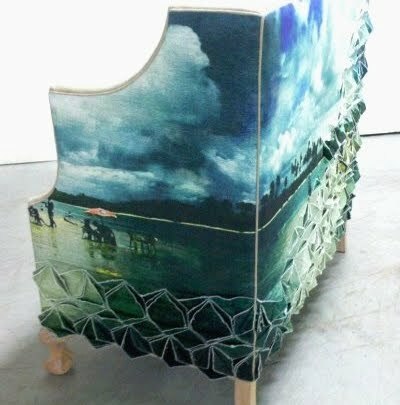 Chaise in shell fabric. Source no longer available. In a nutshell: Strip the chair of its original fabric and use the pieces as pattern. Then pin the pieces wrong sides out onto the chair. Remove pinned cover and sew it together, with welting reinforcing the seams. Put sewn cover back on the chair. It should fit like a glove.